Once, Special Agent Smoky Barrett hunted serial killers for the FBI. She was one of the best–until a madman terrorized her family, killed her husband and daughter, and left her face scarred and her soul brutalized. Turning the tables on the killer, Smoky shot him dead–but her life was shattered forever. Now Smoky dreams about picking up her weapon again. She dreams about placing the cold steel between her lips and pulling the trigger one last time. Because for a woman who’s lost everything, what is there left to lose? In all her years at the Bureau, Smoky has never encountered anyone like him–a new and fascinating kind of monster, a twisted genius who defies profilers’ attempts to understand him. And he’s issued Smoky a direct challenge, coaxing her back from the brink with the only thing that could convince her to live. The killer videotaped his latest crime–an act of horror that left a child motherless–then sent a message addressed to Agent Smoky Barrett. The message is enough to shock Smoky back to work, back to her FBI team. And that child awakens something in Smoky she thought was gone forever. Suddenly the stakes are raised. The game has changed. For as this deranged monster embarks on an unspeakable spree of perversion and murder, Smoky is coming alive again–and she’s about to face her greatest fears as a cop, a woman, a mother…and a merciless killer’s next victim. 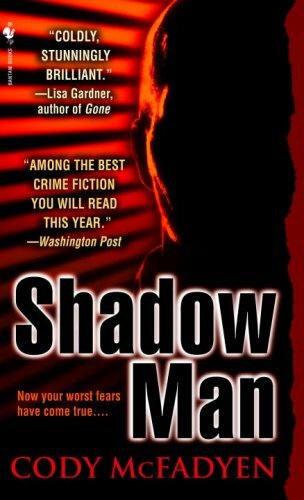 I’ll have to admit, at first when I started listening to Shadow Man, I was skeptical. The first hour or so that I listened to, I was a bit confused over what was going on but that soon changed. I was glad that I was listening to this at work, because I could easily stop when I was at a more suspenseful part and take a break (aka, go and bug my co-workers) before resuming the listening. The author has a way with his writing that made me feel as though I was with Smoky as she was dealing with the crimes perpetrated by the killer. In this instance, I had an inkling of who I thought the killer was, but nothing was clear up until the final reveal and then it was a definate ah-ha moment. I enjoyed Kate Reading’s narration – to my knowledge, I don’t think that I have ever listened to anything that she has narrated before. I know that I will def. look out for more stuff done by her in the future and will be continuing this series for sure (I already have the next one on my queue at booksfree.com). I would likely never have picked up this book to listen to if it hadn’t show up on the list of books that readers who enjoyed Vanish (Tess Gerritsen) also enjoyed and I am glad that I did.